The Individualised Neuromuscular Quality of Life (INQoL) questionnaire is a published muscle disease specific measure of QoL that has been validated using both qualitative and quantitative methods in a United Kingdom population of adults with muscle disease. If INQoL is to be used in other countries it needs to be linguistically and culturally validated for those countries. It may be important to understand any cultural differences in how patients rate their QoL when applying QoL measures in multi-national clinical trials. We conducted a postal survey of QoL issues in US adults with muscle disease using an agreed translation, from UK to US English, of the same questionnaire as was used in the original construction of INQoL. This questionnaire included an opportunity for free text comments on any aspects of QoL that might not have been covered by the questionnaire. We examined the responses using both quantitative and qualitative approaches. The frequency of the responses in US versus UK populations was compared using appropriate correlation tests and Rasch analysis. A phenomenological approach was used to guide the qualitative analysis and facilitate the exploration of patients' perceptions and experiences. The US survey received 333 responses which were compared with 251 UK survey responses. We found that INQoL domains covered all the issues raised by US subjects with no additional domains required. 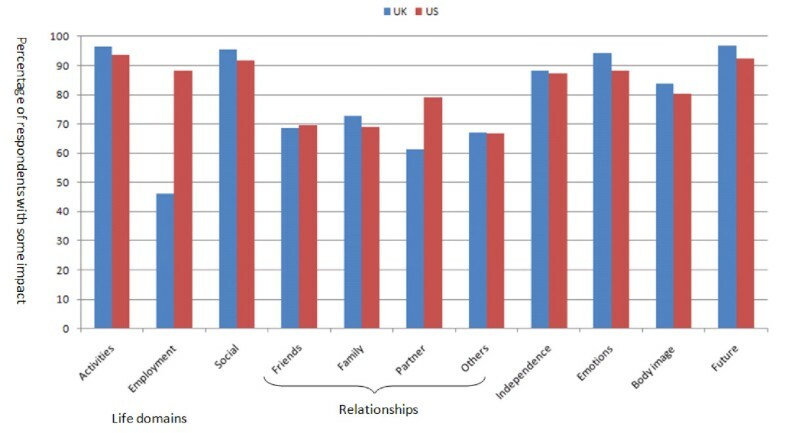 The experiences of those with muscle disease were remarkably similar in the US and UK but there were differences related to the impact of muscle disease on relationships and on employment which was greater for those living in the United States. The greater impact on employment was associated with a higher importance rating given to employment in the US. This may reflect the lower level of financial support for those who are unemployed, and the loss of employment related health benefits. INQoL is appropriate for use in US population but there may be differences in the importance that US subject attach to certain aspects of QoL that could be the basis for further study. If these differences are confirmed then this may have implications for the interpretation of QoL outcomes in multi-national trials. Muscle diseases (MD) are a group of conditions that can be acquired or genetic and which result in progressive shrinking and weakness of the skeletal muscle such as to cause varying degrees of disability. The individual muscle diseases differ in their age of onset, their rate of progression and their pattern of weakness which in turn dictates the nature and extent of the disability that they cause. The disability caused by MD impacts upon quality of life. The Individualised Neuromuscular Quality of Life (INQoL) questionnaire is a MD specific measure of QoL that has been validated using a UK population . The construction of INQoL was based upon both qualitative and quantitative methods which established the face, content and construct validity, the reliability (test re-test) and to some extent the responsiveness of INQoL. Because QoL is a patient reported subjective measure it is important to ensure that it remains valid when used in countries other than the UK where language and culture vary. In order to achieve this linguistic and cultural validity for the use of INQoL for MD patients in the United States, we needed to first agree upon an American English translation. We also needed to ensure that the QoL domains identified in the UK research were also appropriate for patients from the United States and check that there were no additional domains that might require inclusion. Most publications on the differences in QoL between countries have focussed on validation of questionnaires across different countries rather than the actual difference in perceptions of QoL in different countries for a given disease [2–6]. There has been no direct comparison of QoL issues for MD in different countries. In performing our primary process of linguistic and cultural validation of INQoL for use in the United States we gained a unique opportunity to contrast and compare the UK and US experiences of those with MD and take this opportunity to present these results. Although the use of validated QoL scales in MD does allow the collection of quantitative data that can be used in clinical studies and therapeutic trials, the process of reducing QoL to simple figures may obscure the experience of how living with MD really affects people. Qualitative research such as that required for the construction of questionnaires like INQoL does allow a closer appreciation of individuals' experiences of living with chronic disease and disability [7–9]. We therefore take this opportunity to report the verbal and written comments from both UK and US patients that provide unique insights into the actual impact of MD on their lives. While the UK quotes were the subject of qualitative analysis for the construction of the original INQoL, they have not been previously reported verbatim. UK patients were recruited from the MD clinic of King's College Hospital and from two UK muscle patient support groups. US patients were recruited from the muscle clinics of three US centres. Patients were eligible to take part in the study if their MD had been symptomatic for at least six months. MD diagnoses were confirmed through expert opinion using standard diagnostic criteria and confirmatory testing, including where appropriate molecular genetic analysis, serum creatine kinase levels, clinical neurophysiology studies, or muscle biopsy. Patients had to be aged 16 years and above and literate in English. Patients with major co-morbidity from other active cardiac, respiratory or rheumatologic disorders which would affect quality of life were excluded. Patients were sent a questionnaire designed around the life domains that had been identified during the original UK semi-structured interviews . For each domain there were closed ended questions asking the extent to which their MD affected this domain (on a five point Likert scale from 'not at all' affected to 'very much' affected) and the importance that they attached to this impact (on a five point Likert scale, ranging from 'not at all important' to 'extremely important'). We also asked whether the impact was "good" or "bad" and encouraged free text comments on the impact of MD on these life domains to allow respondents to provide greater detail of their experiences and include information not tapped by the close ended questions. The UK version of this questionnaire was independently converted into US English by the principal investigators from each of the three US centres (SP, JTK, CJ). Each US investigator then returned their version to the UK investigators (MR, VB) who collated the different versions, and resolved any inconsistencies by group discussion between all US and UK investigators to reach a consensus. Examples of divergence from the UK version included word changes such as; "tick" changed to "check", "stick" changed to "cane" and "colleague" changed to "co-worker". We also collected data for respondents' gender, age and muscle disease diagnosis. The questionnaires were sent with a prepaid envelope for return. Non-responders were sent another questionnaire two weeks later and further non-responders were sent a reminder letter one week later. The study had Institutional Review Board approval from all the institutions involved. For each life domain we compared the frequency distribution of UK versus US responses for both the extent of the impact and the importance of the impact. We also computed an overall impact score by assigning a ranking order to the product of the two factors (extent and importance) giving an overall impact scale from 1 to 9. Due to relatively large sample size and normal distribution we anticipated there would not be any difference between results of parametric and corresponding non-parametric tests; this was in fact the case. 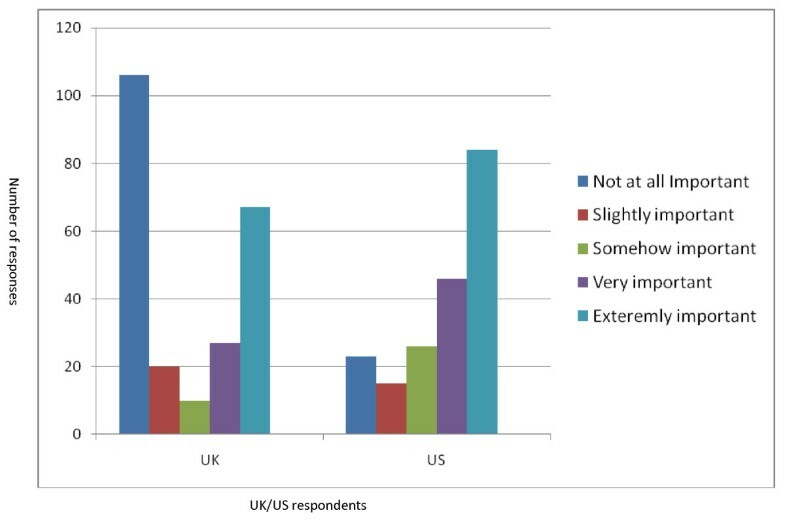 Thus parametric unpaired t-test analysis was performed to compare UK and US responses. Chi squared test was used to compare the UK and US responses for the direction of the impact, as good or bad. We performed Rasch analysis to examine the psychometric properties of the questionnaire in US and UK populations. In this model, responses to each question have a probabilistic correlation with the difficulty of the question . We calculated fit of the observed data to the Rasch model and compared responses to questions in UK and US populations. In the course of the original UK construction of INQoL, interviews with 41 subjects were tape recorded and transcribed . A phenomenological approach was used to guide the analysis and facilitate the exploration of patients' perceptions and experiences [8, 11]. Themes were extracted and clustered together into categories representing life domains influenced by MD. A coding scheme was devised to represent the individual domain and sub-domain categories and this was applied to the data. Finally the validity of the coding scheme was verified through an external inspection by a second categorizer (AJC) who applied the scheme to a sample of interviews. We applied the same coding scheme to the free text comments given to us by both the UK and US respondents of the postal questionnaire. SPSS for Windows version 15.0 was used for statistical tests and Winstep version 3.68.2 was used to do the Rasch analysis. The UK survey received 251 responses (response rate 47%) comprising 90 males and 161 females (ratio 1:2.8) ages 16- 96 (mean age 52.61, SD = 15.95). The US survey received 333 responses of which 10 had to be excluded because of missing data (effective response rate 50%). This sample comprised 176 males and 147 females (ratio 1.19:1) ages 18- 84 (mean age 50.15 years SD = 16.16) (Table 1). Diseases represented in both UK and US samples included congenital myopathies, limb girdle muscular dystrophies, facioscapulohumeral muscular dystrophy, dystrophic and non-dystrophic myotonias and inflammatory myopathies. The percentage of UK and US patients scoring some impact (i.e. scoring 2 to 5 for extent of impact), or no impact (scoring 1) for each of the domains is given in Figure 1. For the UK population the percentage reporting some impact ranged from 45% for Work to 96% for both Activities of Daily Living (ADL) and the Social and Leisure domain. For the US population the percentage reporting some impact ranged from 65% for Relationship with others to 94% for ADL. The percentage of UK and US respondents endorsing some impact of their muscle disease on each of the life domains. Table 2 gives the impact scores (extent of impact, importance of impact and overall impact) for each of the life domains and the results of the significance tests between the UK and US samples. 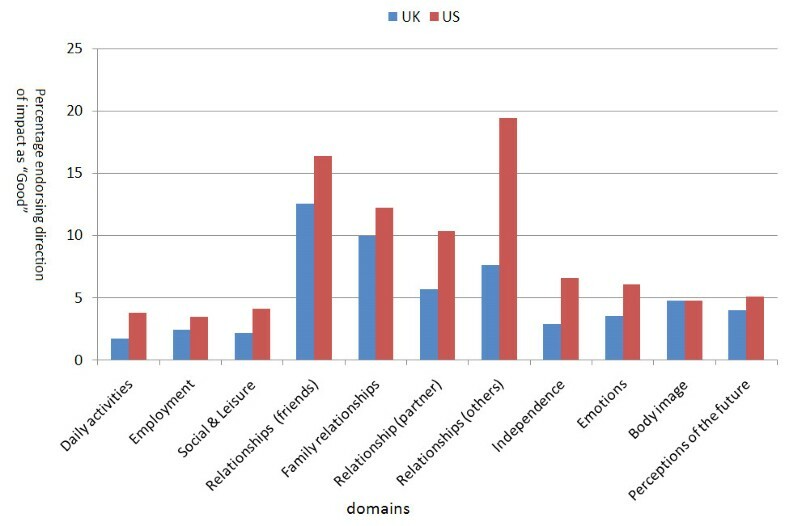 The overall importance score of all the relationship domains (Friends, Family, Others and Partners) were significantly higher in US patients compared to UK patients. This difference was not due to any difference in the extent of the impact but was due to there being a greater importance attached to the impact of MD on relationships by the US patients. US respondents scored a significantly higher impact in the Employment domain. For all domains the direction of the impact was negative for the majority of both UK and US respondents. What was interesting was that there was a significant minority who reported a positive impact of their muscle disease on relationships. (Figure 2). The percentage of the UK and the US samples endorsing the direction of impact as being "Good" for each of the domains. Since the UK and US populations differed in gender distribution we performed unpaired t-test to explore the effects of gender on the responses. For all domains except "Body Image" males had higher impact scores compared to females. Females reported a significantly higher impact of their MD on "Body Image" domain than did males (Overall Impact score: mean female rank 260.7 versus male rank 218.48; P = 0.001). When this was separated out to look at UK and UK samples, UK female patients had higher impact on body image domain than UK male patients (P = 0.001); however there was no significant difference between US female and male patients. There was also no significant difference between UK and US female patients in body image impact score; but US male patients had a higher impact on body image than UK male patients (P = 0.005). The difference between body image scores in two populations is reduced by mixing UK male and female patients. Performing ANCOVA test considering gender as a covariate enabled us to control for the gender ratio difference in the two populations, and showed that the higher impact on employment and relationships in the US population remained and was therefore independent of the gender ratio difference: Employment (F = 25.925, P < 0.001), Relationships with friends (F = 14.865, P < 0.001), Family relationships (F = 12.529, P < 0.001), Relationship (partner) (F = 22.127, P < 0.001), Relationships with others (F = 10.312, P < 0.001), Body image (F = 8.926, P < 0.001), Perceptions of the future (F = 7.091, P = 0.001)). We also explored the possible impact of age on impact scores by splitting the sample into those under and over 50 years-old. Those over 50 years-old had higher scores for all domains with the exception of the domain "Employment" for which those under 50 years-old scored a higher impact (Overall Impact score: mean rank for younger patients 220.46 and older patients 168.96; P value < 0.001). Rasch analysis gives outfit mean square values (msnq). Outfit msnq values represent the proportion of items "out of range" ie for which there is a higher proportion of "easy" or "difficult" responses than expected. Mean squares values between 0.70 and 1.50 are accepted as reasonably fit in psychological studies. On the whole, the questionnaire had very good outfit msnq (1.12). However the questionnaire items relating to "Work importance" and "Work impact" had outfit msnq values of 2.36 and 2.06 respectively meaning that they were the most "difficult" items for participants to endorse. This was mainly due to the effect of UK responses to the employment question as 106 patients (42% of UK population) answered "Employment importance" and "Employment impact" as "not important at all" as shown in Figure 3. Showing how UK and US sample differed in their responses for question 2C; "How important is the effect of your muscle disease on employment". Table 3 summarises the specific issues raised by these patients and how they were clustered into the domains and sub-domains used for INQoL. The US respondents' free text comments gave them an opportunity to raise specific issues outside of the closed ended questions. In general these free text comments reflected issues already raised by UK patients and therefore already encompassed by the existing INQoL domains. Where additional specific issues were raised by US respondents, these also fitted into the existing domains. The quotes of patients illustrate the issues explored by INQoL, and provide insight into the real impact that MD has on these patients. In some cases the quotes from UK and US patients are remarkably similar. All the UK quotes including those in the sample given here were the ones grouped into the broad domains that made up the final INQoL UK questionnaire. These domains clearly corresponded across the UK and US surveys. The specific issues raised by the US population given in bold italics are different to those raised by UK subject but fit within the existing sub-domains and domains as shown. "A lot of "friends" simply drift away when it is obvious there is a chronic condition which is unlikely to change, and when one can no longer go out and about to mutual interests or be relied on to entertain at home. Someone who would rather go to bed than even sit and talk becomes of little interest to any but the most long suffering of friends." UK patient. "You're not that bad." - US patient referring to comments about relationships & social interaction. "Most people don't understand Inclusion Body Myositis. Of course, this is also true of doctors" - US patient. "Due to my limits I find I am a bit more concerned about my relationships with other close family members. I require more from them." - US patient. Problems of access to the homes of friends and family and to social venues were also a source of difficulty for relationships. "My muscle condition, weakness (and) tiredness destroyed my marriage in the end. I'm now on my own and can see no future with myself ever having a relationship with anyone ever again, it's just too hard." - UK patient. "How could it not affect spouse. Walking slowly, vacation planning, lack of spousal relationships, loss of 60% income - wife had to go back to work & my only son just started college." - US patient. The themes relating to emotions and other psychological issues were very much intertwined and respondents tended to comment upon the emotional impact of MD in the context of the other life domains. For example, patients' fears about the future had a considerable impact upon the emotional feelings expressed. Independence was also intertwined with perceptions about appearance, fears about the future and religiosity as coping strategy;. The results of this analysis show that the quality of life domains used by INQoL effectively captures the experiences of both UK and US patients with MD. The quantitative data shows that all the domains were embraced by US patients as they were by UK patients. The qualitative data suggests that the issues raised by both UK and US populations are very similar and no new items were identified by the US survey that could not reasonably be fitted into the domains already chosen. As with all such studies selection and responder biases raise questions about the generalisability of our findings but the sample sizes are large for these rare diseases and the findings are in accordance with our clinical experience. For the majority of both UK and US patients muscle disease had a detrimental effect on quality of life domains but a significant minority reported a beneficial effect on relationships. In interviews this minority reported that their muscle disease had made them closer to family and friends for a variety of reasons. The significant quantitative differences in the domain impact responses between the two countries are of interest but cannot be assumed to be simply due to cross cultural differences. There are a number of potential differences between the UK and US populations that may have accounted for different response rates. One known difference between the UK and US populations is gender distribution. Our analysis suggests that this may explain some of the differences in that males scored a higher impact for most domains than did females with the exception of "Body Image" where females scored higher. The two samples were fairly similar in age distribution and so the differences in responses we found between those under and over 50 years-old seem unlikely to account for any difference in responses of the UK versus US populations' responses. Similar issues were raised in a study of the effect of epilepsy on psycho-social factors which showed US, New Zealand and UK subjects had some different scores but that interpretation of these was confounded by various demographic variables and the unknown differences in the type and severity of the epilepsy in the three national groups . Other important factors to consider would be the distribution of specific muscle disease diagnoses, and the range of muscle disease severity. The UK and US population were recruited in different ways which is likely to have led to differences in disease distribution and severity. Such differences may have had an important bearing upon interpretation of any differences in impact scores not just those between countries but also those between other groups such as gender. That females report more impact of their MD on Body Image might be considered not surprising. However, in order to fully appreciate whether this is a true gender difference, one would have to take account of the specific muscle diseases present in the male and female populations and the severity of such diseases. Some muscle diseases have more obvious effect on Body Image than others. Facial features such as facial weakness in facioscapulohumeral dystrophy, or ptosis in myotonic dystrophy may mean these diseases impact more on Body Image than does limb girdle muscular dystrophy which usually has no facial involvement. Inflammatory muscle diseases are treated with steroids which may have side effects such as weight gain, moon face, hirsuitism, and buffalo hump that may disproportionately affect Body Image. More severe muscle disease affects the gait and movements generally and can of course mean that one is obliged to use a wheelchair. Some patients referred to these aspects when explaining the impact of their MD on Body Image. If however the differences in disease impact recorded by UK and US populations reflect true cross cultural differences, this raises further interesting questions for research. The greater importance that the US population attaches to Relations with family and friends may reflect differing societal values. The lesser impact of muscle disease on Employment in the UK may be due to the fact that unemployed UK patients are better supported by the social security system such that lack of employment has less impact and importance for them. Conversely we had expected some differences between the UK and the US that did not in fact materialise. The impact of muscle disease on Activities was the same for UK and US despite the longer duration of disability access legislation in the US and the higher proportion of spacious urban living in the US as compared with the higher proportion of crowded city living in the UK. The influence of differences in health care systems, social care, support networks and cultural perceptions on QoL in different countries could be the subject of further illuminating research. Lessons from different countries might then shape public and social policy for the benefit of those with MD. A practical challenge that arises from any future MD research in this field concerns the heterogeneity of MD. Collectively MD is common but it is made up of a variety of individual diseases each of which may each be rare. It is reasonable to study them collectively as all MD may have common symptoms of weakness, fatigue, or pain and doing so means one can obtain sufficient numbers for quantitative research. However the individual MDs do differ in their age of onset, distribution of weakness, speed of progression and severity of symptoms. For some questions controlling for all these factors in future research may be challenging. Only future research will tell us to what degree lumping or splitting of the muscle diseases is required for quality of life research. This study was supported by the Muscular Dystrophy Association of USA. RS helped draft the paper and did the statistical analysis. KAV, AJC and JW collected and analysed the UK data. SP, JTK and CJ collected the US data. VB collated and performed qualitative analysis on the US data. MRR was principle grant holder for the project and drafted the paper. All authors are members of the Muscle Study Group that helped initiate this research. All authors read and approved the final manuscript.